We spent few days at the lake last month with friends, and it was the first time my children have ever been on jet skis. And now apparently we are going to buy jet skis, and a trailer to transport them on, and a truck to pull the trailer, and a shed to store them in, etc., etc. 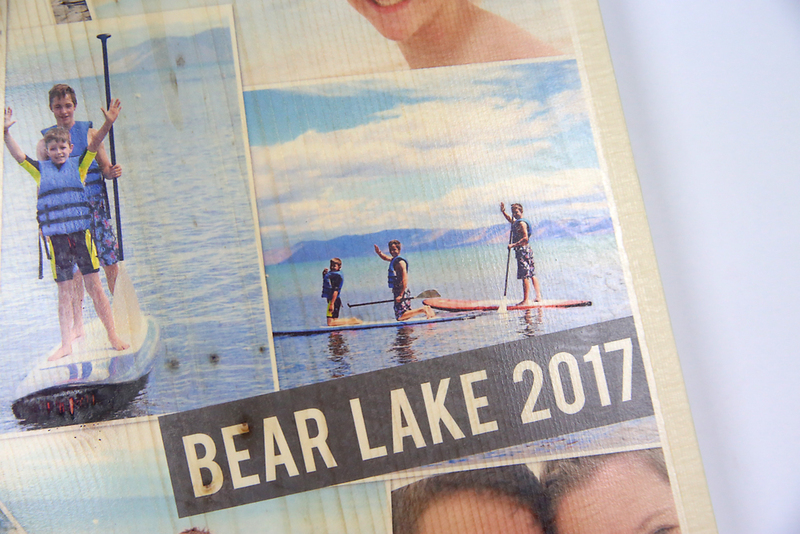 Needless to say, it was a really fun trip, so I wanted a fun way to display some of our favorite photos from the lake. 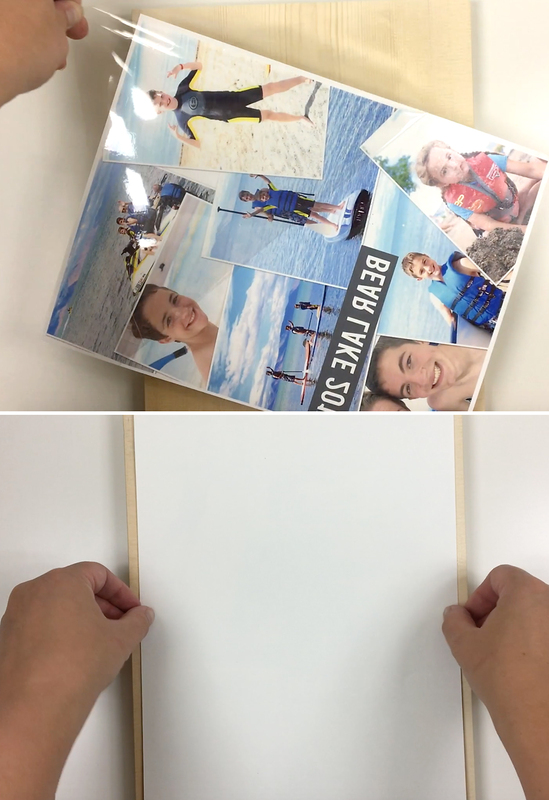 I used Adobe Photoshop Elements 15 to make a super easy drag-and-drop photo collage and was looking for a way to display it when I came across a new, unbelievably simple way to transfer photos to wood. Other transfer methods make a mess and take a lot of time, but this one can be completed in about 15 minutes using temporary tattoo paper. Thank you to Adobe for sponsoring this post. Today’s post is a twofer. 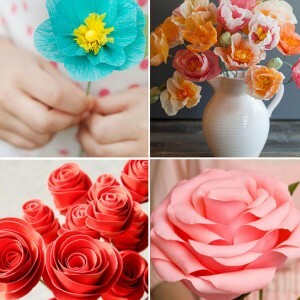 First I’ll show you how to make a photo collage in minutes using Photoshop Elements 15. 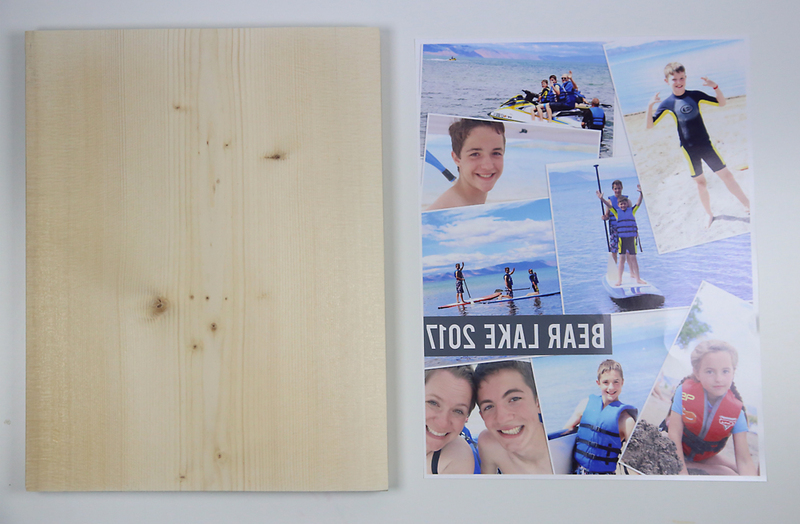 Then I’ll walk you through the easier-than-ever photo transfer to wood (seriously, this is simple). 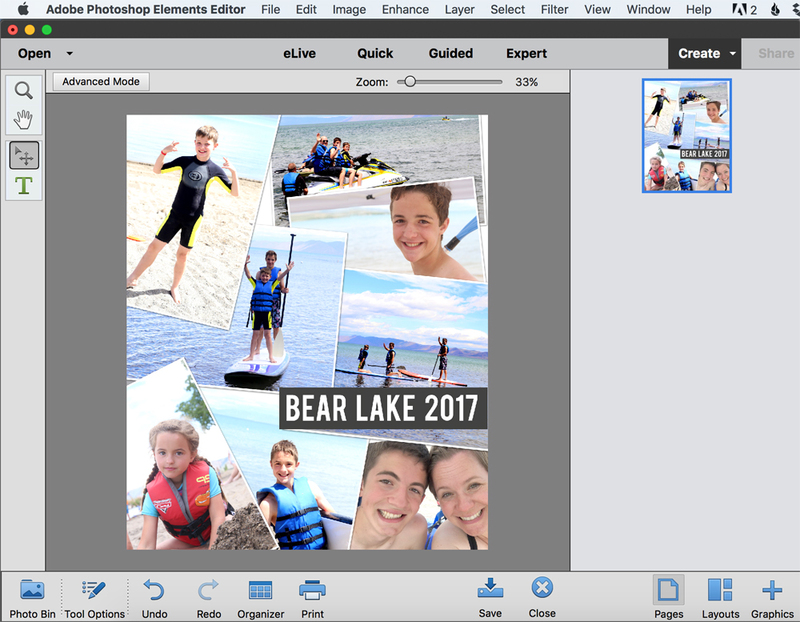 The Create dropdown menu in Photoshop Elements allows you to easily create greeting cards, photo calendars, photo collages, a Facebook cover photo, and more. 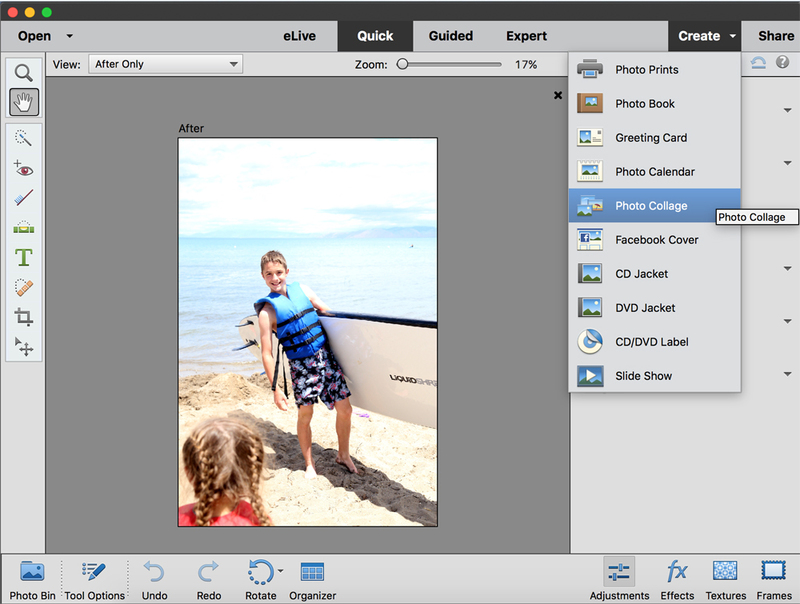 You can access the Create menu from either the Photo Editor or the Organizer. Pretty slick, right? 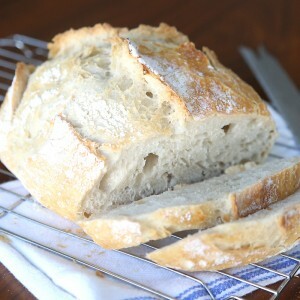 Functions like this make Photoshop Elements my favorite photo editing software (I use it almost every day!). Click here to download a free trial if you’d like to make your own photo collage. 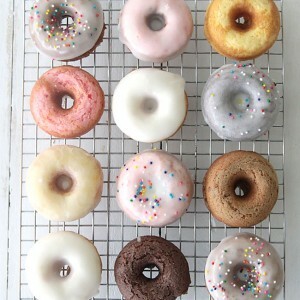 You can also follow the written instructions found here. 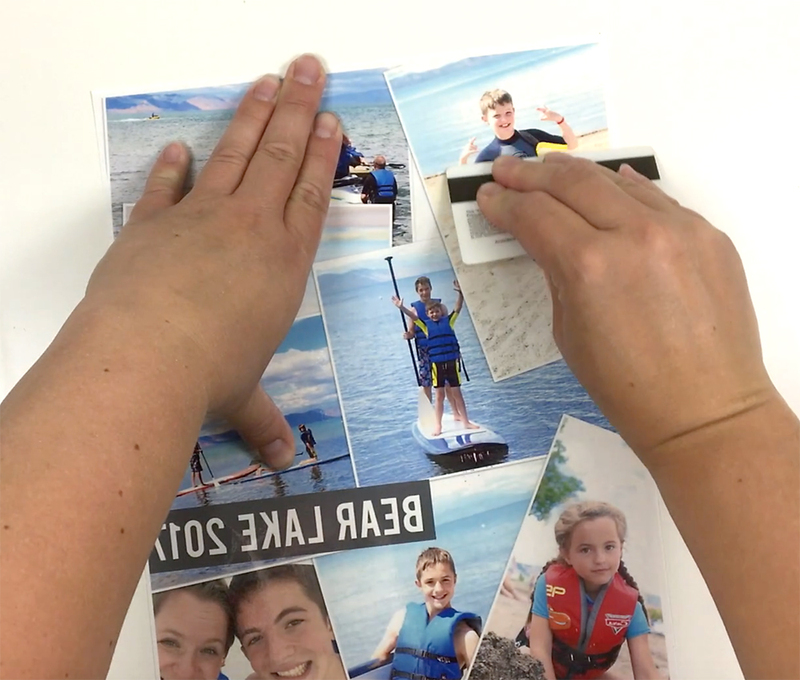 Watch this quick video to see how the photo transfer works. Written instructions follow. 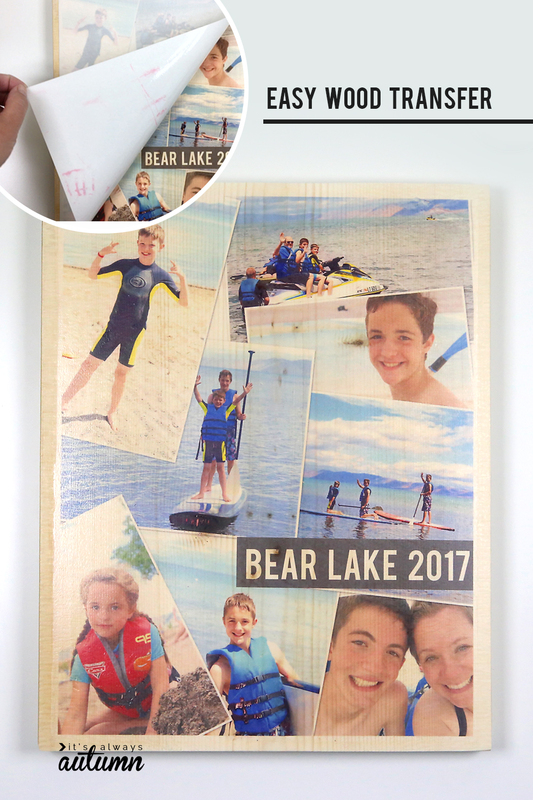 2 – Remove the green backing from a plastic adhesive sheet and place the adhesive sticky side down on your printed image. Use a credit card to smooth the adhesive sheet down. 3 – Peel off the plastic backing from the adhesive. 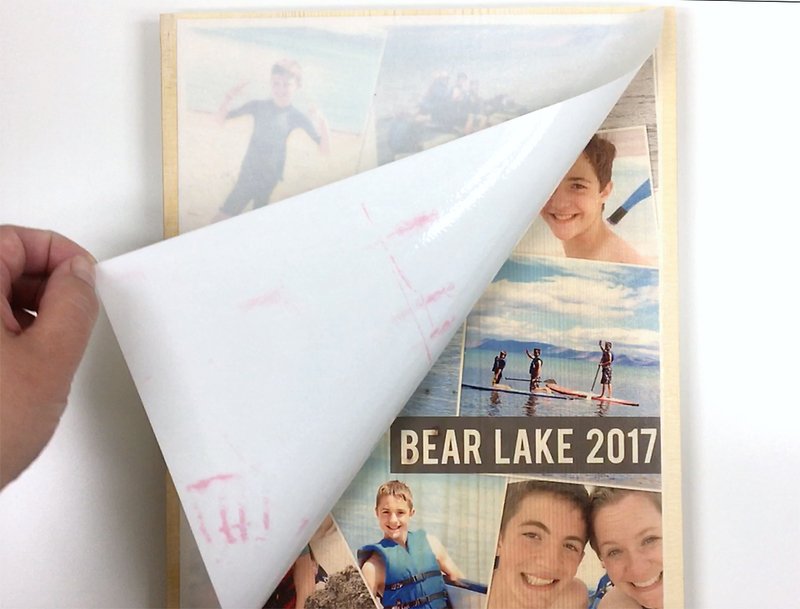 Now the adhesive is stuck to your printed image. Place the image face down on your piece of wood. Smooth it down. 4 – Place a damp towel over the tattoo paper and rub it gently to dampen the paper. 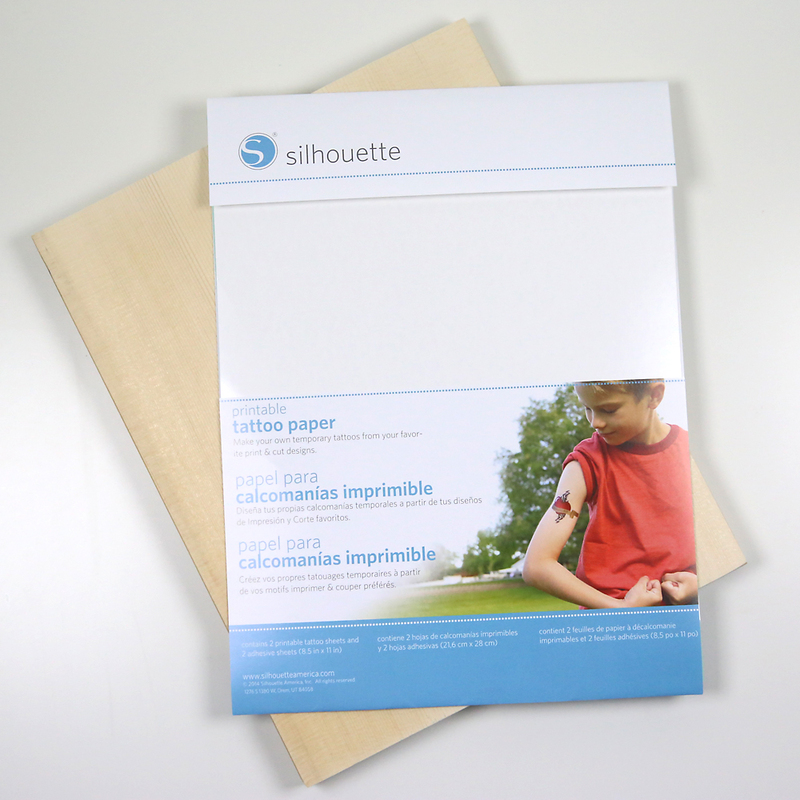 After about 15 seconds the paper should easily peel off, leaving your design transferred onto the wood. If there are any bubbles in the design, use your damp towel to gently smooth them out. 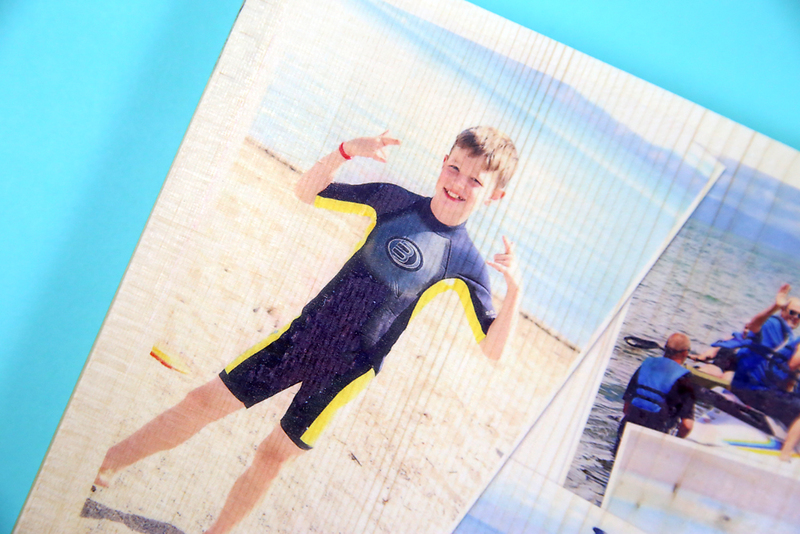 The really cool thing about wood photo transfers is that you can see the grain of the wood right through the photo! 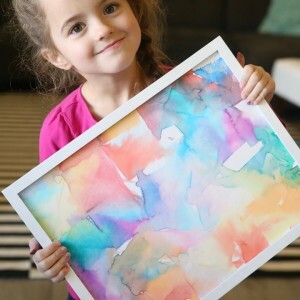 As an optional final step, you can paint the photo transfer with a thin layer of Matte Mod Podge to seal it. 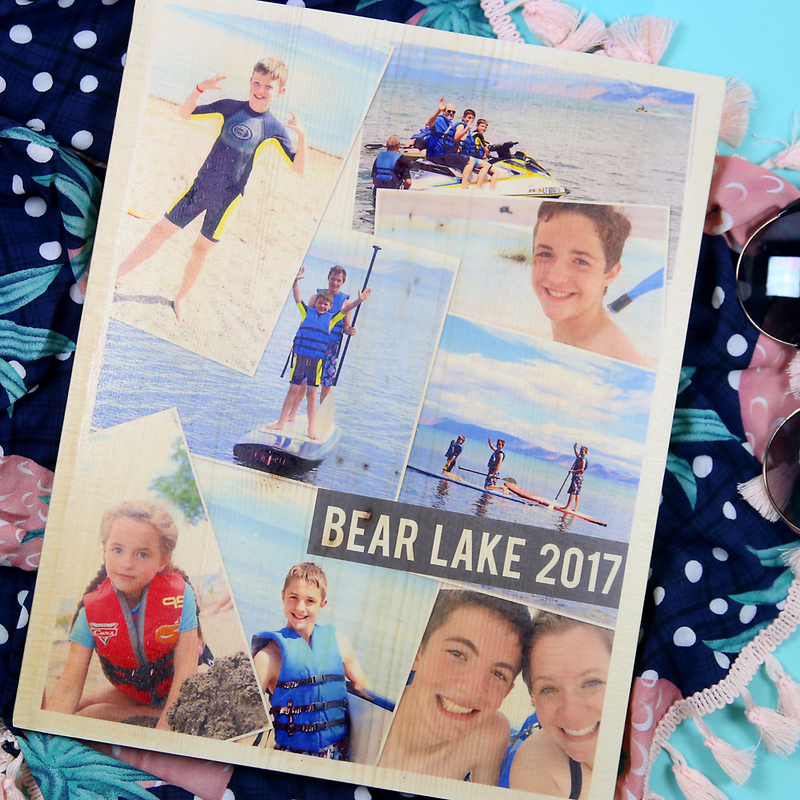 Have fun making your own wood transfer photo collage, and visit my other Photoshop Elements tutorials here. 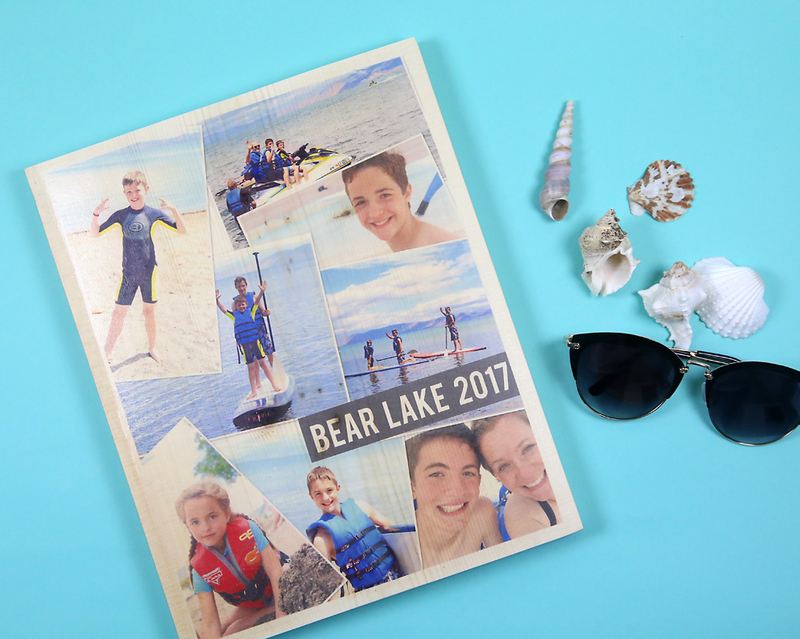 Click here for even more photo craft and DIY photo gift ideas! WOW!!!! This is SO much easier than using,………….another product which shall become “nameless” at this moment!!!! Thank You for sharing this AHA moment!!!! what is the adhesive sheet called ? did you use an ink jet printer?